The Airbus A380 is a double-deck, wide-body, four-engine airliner manufactured by the European corporation Airbus, a subsidiary of EADS. Designed to challenge Boeing's monopoly in the large-aircraft market, the A380, the largest passenger airliner in the world, made its maiden flight on 27 April 2005 from Toulouse, France, and made its first commercial flight on 25 October 2007 from Singapore to Sydney with Singapore Airlines. The aircraft was known as the Airbus A3XX during much of its development phase, but the nickname Superjumbo has since become associated with it. The A380's upper deck extends along the entire length of the fuselage, and its width is equivalent to that of a widebody aircraft. This allows for an A380-800's cabin with 5,146 square feet (478.1 m2) of floor space; 49% more floor space than the current next-largest airliner, the Boeing 747-400 with 3,453 square feet (320.8 m2), and provides seating for 525 people in a typical three-class configuration or up to 853 people in all-economy class configurations. The A380-800 has a design range of 15,200 km (8,200 nmi; 9,400 mi), sufficient to fly from New York to Hong Kong for example, and a cruising speed of Mach 0.85 (about 900 km/h or 560 mph at cruising altitude). As of May 2011, 234 firm orders have been placed, of which 49 had been delivered. The largest order came from Emirates, which has 90 aircraft on order. Major structural sections of the A380 are built in France, Germany, Spain, and the United Kingdom. Due to their size, they are brought to the assembly hall (the Jean-Luc Lagardère Plant) in Toulouse in France by surface transportation, though some parts are moved by the A300-600ST Beluga aircraft used in the construction of other Airbus models. 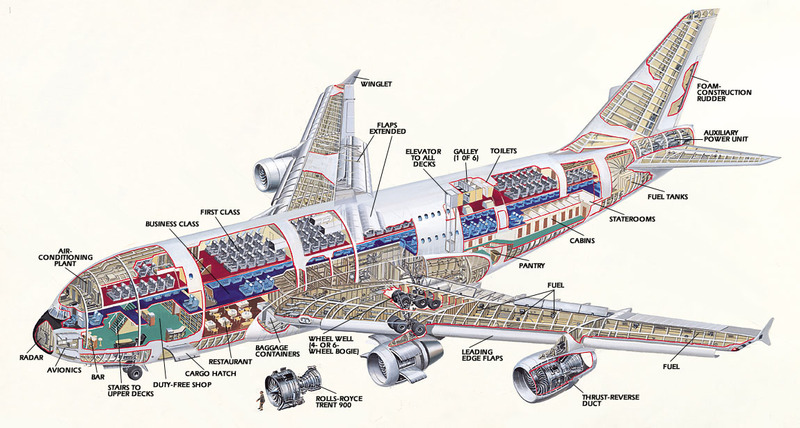 Components of the A380 are provided by suppliers from around the world; the five largest contributors, by value, are Rolls-Royce, Safran, United Technologies, General Electric and Goodrich. For the surface movement of large A380 structural components, a complex route known as the Itinéraire à Grand Gabarit was developed. This involved the construction of a fleet of roll-on/roll-off (RORO) ships and barges, the construction of port facilities and the development of new and modified roads to accommodate oversized road convoys. The front and rear sections of the fuselage are loaded onto one of three roll-on/roll-off (RORO) ships in Hamburg in northern Germany, from where they are shipped to the United Kingdom. The wings, which are manufactured at Filton in Bristol and Broughton in North Wales, are transported by barge to Mostyn docks, where the ship adds them to its cargo. In Saint-Nazaire in western France, the ship trades the fuselage sections from Hamburg for larger, assembled sections, some of which include the nose. The ship unloads in Bordeaux. Afterwards, the ship picks up the belly and tail sections by Construcciones Aeronáuticas SA in Cádiz in southern Spain, and delivers them to Bordeaux. From there, the A380 parts are transported by barge to Langon, and by oversize road convoys to the assembly hall in Toulouse. After assembly, the aircraft are flown to Hamburg Finkenwerder Airport (XFW) to be furnished and painted. It takes 3,600 L (950 US gal) of paint to cover the 3,100 m2 (33,000 sq ft) exterior of an A380. Airbus sized the production facilities and supply chain for a production rate of four A380s per month. Five A380s were built for testing and demonstration purposes. The first A380, serial number MSN001 and registration F-WWOW, was unveiled at a ceremony in Toulouse on 18 January 2005. Its maiden flight took place at 8:29 UTC (10:29 am local time) 27 April 2005. This plane, equipped with Trent 900 engines, flew from Toulouse Blagnac International Airport with a flight crew of six headed by chief test pilot Jacques Rosay. After successfully landing three hours and 54 minutes later, Rosay said flying the A380 had been “like handling a bicycle” . On 1 December 2005 the A380 achieved its maximum design speed of Mach 0.96 (versus typical cruising speed of Mach 0.85), in a shallow dive, completing the opening of the flight envelope. In 2006, the A380 flew its first high altitude test at Bole International Airport, Addis Ababa. It conducted its second high altitude test at the same airport in 2009. It arrived in North America on 6 February 2006, landing in Iqaluit, Nunavut in Canada for cold-weather testing. On 14 February 2006, during the destructive wing strength certification test on MSN5000, the test wing of the A380 failed at 145% of the limit load, short of the required 150% to meet the certification. Airbus announced modifications adding 30 kg to the wing to provide the required strength. On 26 March 2006 the A380 underwent evacuation certification in Hamburg. With 8 of the 16 exits blocked, 853 passengers and 20 crew left the aircraft in 78 seconds, less than the 90 seconds required by certification standards. Three days later, the A380 received European Aviation Safety Agency (EASA) and United States Federal Aviation Administration (FAA) approval to carry up to 853 passengers. The maiden flight of the first A380 using GP7200 engines—serial number MSN009 and registration F-WWEA—took place on 25 August 2006. On 4 September 2006, the first full passenger-carrying flight test took place. The aircraft flew from Toulouse with 474 Airbus employees on board, in the first of a series of flights to test passenger facilities and comfort. In November 2006 a further series of route proving flights took place to demonstrate the aircraft's performance for 150 flight hours under typical airline operating conditions. Airbus obtained type certificates for the A380-841 and A380-842 model from the EASA and FAA on 12 December 2006 in a joint ceremony at the company's French headquarters. The A380-861 model obtained the type certificate 14 December 2007. The first aircraft delivered (MSN003, registered 9V-SKA) was handed over to Singapore Airlines on 15 October 2007 and entered into service on 25 October 2007 with an inaugural flight between Singapore and Sydney (flight number SQ380). Passengers bought seats in a charity online auction paying between $560 and $100,380. Two months later, Singapore Airlines CEO Chew Choong Seng said that the A380 was performing better than both the airline and Airbus had anticipated, burning 20% less fuel per passenger than the airline's existing 747-400 fleet. Emirates was the second airline to take delivery of the A380 on 28 July 2008 and started flights between Dubai and New York on 1 August 2008. Qantas followed on 19 September 2008, starting flights between Melbourne and Los Angeles on 20 October 2008. By the end of 2008, 890,000 passengers had flown on 2,200 A380 flights totalling 21,000 hours. In February 2009 the millionth A380 passenger flying with Singapore Airlines was recorded. In May 2009 it was reported that the A380 had carried 1.5 million passengers during 41 thousand flight hours and 4200 flights. Air France received their first A380 on 30 October 2009, arriving at Charles de Gaulle Airport. Lufthansa received its first A380 on 19 May 2010. By July 2010 the 31 A380s then in service had flown 156,000 hours with passengers in 17,000 flights, transporting 6,000,000 passengers between 20 international destinations. Airbus used similar cockpit layout, procedures and handling characteristics to those of other Airbus aircraft, to reduce crew training costs. Accordingly, the A380 features an improved glass cockpit, and fly-by-wire flight controls linked to side-sticks. The improved cockpit displays feature eight 15-by-20 cm (5.9-by-7.9 in) liquid crystal displays, all of which are physically identical and interchangeable; comprising two Primary Flight Displays, two navigation displays, one engine parameter display, one system display and two Multi-Function Displays. These MFDs are new with the A380, and provide an easy-to-use interface to the flight management system—replacing three multifunction control and display units. They include QWERTY keyboards and trackballs, interfacing with a graphical "point-and-click" display navigation system. The A380 can be fitted with two types of engines: A380-841, −842 and −843F with Rolls-Royce Trent 900, and A380-861 and −863F with Engine Alliance GP7000 turbofans. The Trent 900 is a derivative of the Trent 800, and the GP7000 has roots from the GE90 and PW4000. The Trent 900 core is a scaled version of the Trent 500, but incorporates the swept fan technology of the stillborn Trent 8104. The GP7200 has a GE90-derived core and PW4090-derived fan and low-pressure turbo-machinery. Only two of the four engines are fitted with thrust reversers. Noise reduction was an important requirement in the A380's design, and particularly affects engine design. Both engine types allow the aircraft to achieve QC/2 departure and QC/0.5 arrival noise limits under the Quota Count system set by London Heathrow Airport, which is a key destination for the A380. The A380 was used to demonstrate the viability of a synthetic fuel comprising standard jet fuel with a natural-gas-derived component. On 1 February 2008, a three hour test flight operated between Britain and France, with one of the A380's four engines using a mix of 60% standard jet kerosene and 40% gas to liquids (GTL) fuel supplied by Shell. The aircraft needed no modification to use the GTL fuel, which was designed to be mixed with normal jet fuel. Sebastien Remy, head of Airbus SAS's alternative fuel programme, said the GTL used was no cleaner in CO2 terms than standard fuel but it had local air quality benefits because it contains no sulphur. While most of the fuselage is aluminium, composite materials comprise more than 20% of the A380's airframe. Carbon-fibre reinforced plastic, glass-fibre reinforced plastic and quartz-fibre reinforced plastic are used extensively in wings, fuselage sections (such as the undercarriage and rear end of fuselage), tail surfaces, and doors. The A380 is the first commercial airliner to have a central wing box made of carbon fibre reinforced plastic. It is also the first to have a smoothly contoured wing cross section. The wings of other commercial airliners are partitioned span-wise into sections. This flowing, continuous cross section optimises aerodynamic efficiency. Thermoplastics are used in the leading edges of the slats. The new material GLARE (GLAss-REinforced fibre metal laminate) is used in the upper fuselage and on the stabilisers' leading edges. This aluminium-glass-fibre laminate is lighter and has better corrosion and impact resistance than conventional aluminium alloys used in aviation. Unlike earlier composite materials, it can be repaired using conventional aluminium repair techniques. Newer weldable aluminium alloys are also used. This enables the widespread use of laser beam welding manufacturing techniques — eliminating rows of rivets and resulting in a lighter, stronger structure. The A380 uses four 150 kVA variable-frequency electrical generators, eliminating constant speed drives and improving reliability. The A380 uses aluminium power cables instead of copper for weight reduction. The electrical power system is fully computerised and many contactors and breakers have been replaced by solid-state devices for better performance and increased reliability. The A380 features a bulbless illumination system. LEDs are employed in the cabin, cockpit, cargo and other fuselage areas. The cabin lighting features programmable multi-spectral LEDs capable of creating a cabin ambience simulating daylight, night, or levels in between. On the outside of the aircraft, HID lighting is used for brighter, whiter illumination. The A380 was initially planned without thrust reversers, as Airbus designed the aircraft with ample braking capacity to not require their use. However Airbus elected to fit the two inboard engines with thrust reversers in a late stage of development. The two outboard engines do not have reversers, reducing the amount of debris stirred up during landing. The A380 features electrically actuated thrust reversers, giving them better reliability than their pneumatic or hydraulic equivalents, in addition to saving weight. Onboard features expected to reduce travel fatigue include a quieter interior and greater cabin air pressure than prior aircraft; the A380 produces 50% less cabin noise than the 747-400 and is pressurised to the equivalent of 1,520 m (5,000 ft) altitude versus 2,440 m (8,000 ft) on the 747-400. The A380 has 50% more cabin area and volume, larger windows, bigger overhead bins, and 60 cm (2.0 ft) extra headroom versus the 747-400. Seating options range from 4-abreast in first class up to 11-across in economy. In an industry where economy seats range from 41.5 cm (16.3 in) to 52.3 cm (20.6 in) in width, A380 economy seats are up to 48 cm (19 in) wide in a 10-abreast configuration on the main deck. The 10-abreast configuration on the 747-400 typically results in seats 44.5 cm (17.5 in) wide. The A380's full-length upper and lower decks are connected by two stairways, fore and aft, wide enough to accommodate two passengers side-by-side; this cabin arrangement allows multiple seat configurations. The maximum certified carrying capacity is 853 passengers in an all-economy-class layout, and Airbus lists the typical three-class layout as accommodating 525 passengers, with 10 first, 76 business, and 439 economy class seats. Planned and announced configurations go from 407 passengers, for Korean Air, up to 840 passengers, for Air Austral. Airbus's initial publicity stressed the comfort and space of the A380's cabin, and advertised the installation of relaxation areas such as bars, beauty salons, duty-free shops, and restaurants. Proposed amenities resembled those installed on earlier airliners, particularly 1970s wide-body jets, which largely gave way to regular seats for more passenger capacity. 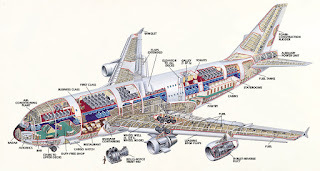 Airbus later acknowledged that some publicised cabin proposals were unlikely to be installed, and noted that it was ultimately up to the airlines to configure the interior. Industry analysts suggested that the customisation options on the planes slowed down production speeds and raised costs. Due to delivery delays, Singapore Airlines and Air France debuted new seat designs on different aircraft before their installation on the A380. Initial operators typically configured their A380s for three-class service, while adding extra features for passengers in premium cabins. Launch customer Singapore Airlines debuted partly-enclosed first class suites on its A380s in 2007, each featuring a leather seat with a separate bed; center suites could to be joined to create a double bed. A year later, Qantas debuted a new first class seat-bed and a sofa lounge at the front of the upper deck on its A380s. In late 2008, Emirates introduced "shower spas" in first class on its A380s, along with a bar lounge and seating area on the upper deck, and in 2009 Air France unveiled an upper deck electronic art gallery. In addition to lounge areas, some A380 operators have installed amenities consistent with other aircraft in their respective fleets, including self-serve snack bars, premium economy sections, and redesigned business class seating.